It will be different for every nation. Some will have been working on their team since IC14 wound up, they will be at least partly funded by well organised sponsorship campaigns or alternate forms of funding. Some will have been scraping a squad and the funding to get them here together for the past few months. There are always some nations that are touch and go to attend up until the final week before the first bounce. One thing is likely as with each of the previous tournaments it will be bigger and better than ever. In 2011 18 men's teams and 7 women's teams competed (with USA and Canada each sending a second women's team. In 2017 we may see the return of nations that couldn't make it in 2011. Two of these teams the "Peace Team" comprised of Israeli and Palestinian players and the Timor Leste Crocs have both shown positive signs in recent times that gives hope to their reprise. Denmark finished fourth in 2002 but were unable to attend 2014. They were dearly missed and hopes are high that they will also return in 2011. The PNG men's team won the 2014 tournament but their women's team, the PNG Flames were unable to attend and they also seem likely to return in 2017. 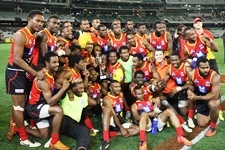 Defending AFL International Cup champions PNG are gathering their best squad of players and drilling them but are also on the lookout for any new talent. The PNG Games later in the year will be part of the selection process as it will provide a good opportunity for the AFL PNG officials to assess the players in selecting the final squad for the 2017 AFL International Cup. AFL PNG are also working to see the women's team known as the Flames back to the International Cup (they failed to send a team to IC14 after previously playing in the IC11 tournament). 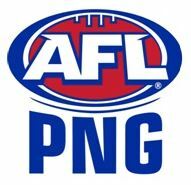 AFL Development Manager in the South Pacific Ben Drew recently responded to us on Twitter that there was "every chance the PNG Flames will attend"
The AFL today announced the details of the 2017 AFL International Cup to be held in Melbourne. Joining the 2014 champions PNG at the sixth iteration of the International Cup will hopefully be at least 20 mens teams. The women's competiton is expected to grow from the five nations that competed in 2014. PNG are the most successful nation at the International Cup winning the competition in 2008 and 2014 as well as finishing runner up in 2002, 2005 and 2011 in the men's division. Ireland (2008) and Canada (2011) have each won the women's competition in the first two cup's that had female teams competing. Recently it has emerged via social media that the dates for the AFL International Cup 2017 had been set. Today the AFL confirmed that these dates are proposed dates only and at this stage have not been locked in. The dates were proposed by the AFL and sent to affiliates for feedback, and at this stage there has been no feedback opposed to these dates. So again, this is not yet 100% confirmed, but it looks likely that IC17 will take place from Saturday August 5 to Sunday August 20, 2017 (inclusive) in Melbourne. The AFL International Cup is the pinnacle event on the Australian Football international calendar and has grown steadily in stature and standard. Despite financial considerations limiting numbers, participation is greater than some other football world cups, yet the IC profile remains low. With this in mind I have started an electronic petition for the SBS to broadcast the IC. It is an ideal event for the SBS as it fulfills all its charter points. The IC is multi-cultural, multi-lingual, entertaining, educational and advances the spirit of world friendship. Without jumping too far ahead, any lift in the profile of the IC will produce direct and indirect benefits for the competition. Those benefits in all probability will be small at first but it is the "foot-in-the-door" to leverage the future. Currently there has great response from individuals at https://goo.gl/GwnmAK but I need organisations to promote this petition to achieve the "reach" simply by sharing WFN's facebook post.